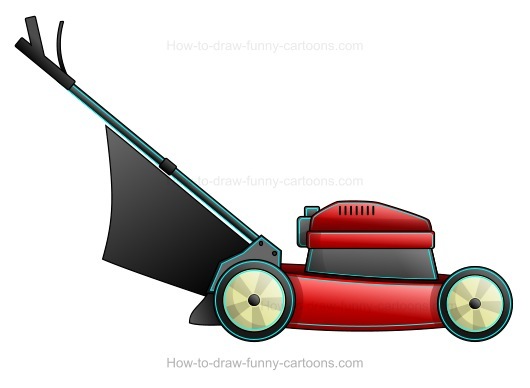 Learn how to draw a fun cartoon lawn mower made from simple shapes, but complex visual effects. Don't worry! These effects are not so difficult to duplicate if you already have some basic knowledge on how to use a vector application. Let me show you how to sketch this unique object and end up with something visually appealing in just six easy steps. First, draw a simple lawn mower using a side view version. Indeed, using perspective can be more challenging and the lawn mower more difficult to create. A side view like the one below is relatively easy to draw and the object is still easily recognizable. Next, add some plain colors on all shapes of the object. It's not really important if these colors are not 100% accurate for now. The goal is just to have a simple view of the lawn mower and see if everything is relevant and close to reality. Great! Every vector application comes with a gradient fill tool. This very useful tool can help you add a second color to an object to create darker and brighter areas. 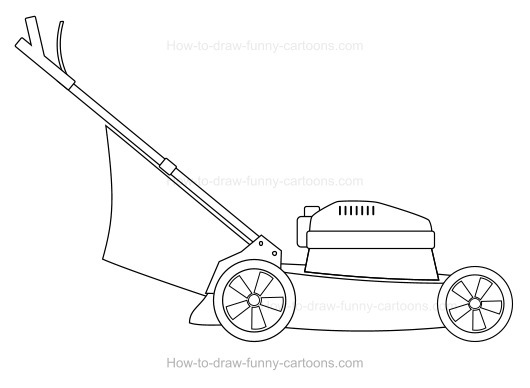 For example, the bag on the back of the lawn mower is filled with a light grey color on top and black on the bottom. You can also do that for all other parts of the object. It's now time to add more shapes to create shadows. You can draw some on the motor, the body of the lawn mower and the wheels. These shapes are illustrated with a blue outline below so that you can read these shapes easily. You can see the result here when all shadows are added. You can compare this illustration with the one in step number three to see the modifications. In this step, our goal is to create highlights on the object. To do so, simple add white shapes on most areas exposed to the light source. Use transparency to partially hide these new shapes. That's how you can draw a cartoon lawn mower!